Chronic back pain is a condition that plagues many of us. It’s estimated that around 31 million Americans have experienced some type of back pain, and it’s one of the most common reasons why people miss work. Because of the demand, there are a number of possible treatments that address the issue. However, not all of them have proven to be consistently effective in reducing back pain. One treatment that has been proven to address chronic back pain is inversion therapy. During inversion, you are placed on a special bed that can be turned upside down. When the body is inverted over a given time period, the spine relaxes and decompresses. This helps ease the strain on your back. Issues like muscle fatigue, sciatica and osteoarthritis can also be addressed with regular inversion therapy. What’s more, the inverted position stimulates blood flow throughout your entire body. Your vital organs are able to function more efficiently, your immune system is better able to flush out toxins, and overall, your health gets a much-needed boost. Because of the many benefits of inversion therapy, it has become a popular go-to for people who do not only want to ease their chronic conditions, but also want to improve their well being. There are many kinds of inversion tables on the market, each with innovative features. But one of the best additions is probably infrared heating technology. Infrared devices use specific spectrums of light in order to create or mimic desired effects within the body’s cellular structure. It was actually developed by NASA as a way to treat astronauts in space! Infrared light can penetrate deep into the skin, reaching cells and water molecules. Some of the wonderful effects of infrared include increased blood circulation, improved muscle condition and accelerated healing of tissues. You might be familiar with those typical heating pads or devices that are sold in local pharmacies. You may also be wondering what the difference is between regular heat and infrared. Well, a regular heating pad uses electricity to generate heat. The type of heat created is superficial, giving warmth that is just skin deep. The heat never reaches deep into the muscle tissues. Hence, you’ll notice that relief is only temporary; once you take off the heat, the pain returns. On the other hand, infrared heating emits infrared rays from carbon fibers. This type of heat penetrates much deeper – reaching the muscles, nerves and bones. One study tested the effects of infrared on participants with chronic lower-back pain. Six weekly treatments were given to the participants. After the treatments, it was found that exposure to infrared reduced back pain by 50% compared to the placebo group. A few minutes of infrared therapy can bring hours of relief without any medication. Not only that, infrared can actually heal damaged cells faster because it supports rehabilitation. The heat from infrared is actually better than sunlight, which can have harmful UV rays. Infrared devices essentially remove all the harmful light spectrum's and deliver only therapeutic doses of light. It can’t burn you the same way that heat from an electric source can. It’s been proven to be so safe that the heating technology is actually used in many neonatal units. One advantage of infrared technology is that they are already calibrated for home use. There are medical-grade infrared devices (e.g., pads) that can be used conveniently. 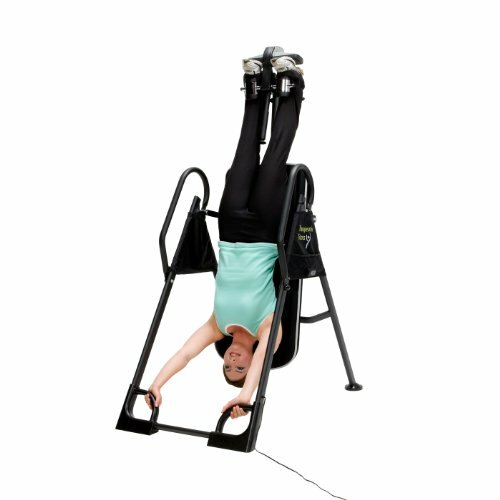 If you are engaging in inversion therapy, you can combine two kinds of therapy by choosing an inversion table that has a built-in infrared system. 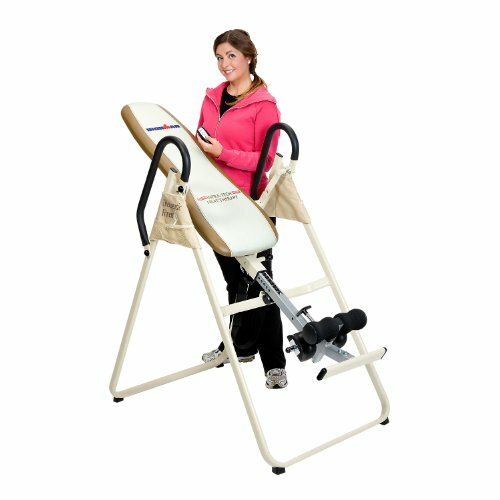 This equipment may be a little bit pricier than other inversion table models, but the additional health benefits of infrared heat are worth the increased price. We have compiled a list of the top infrared inversion tables on the market and reviewed their features. 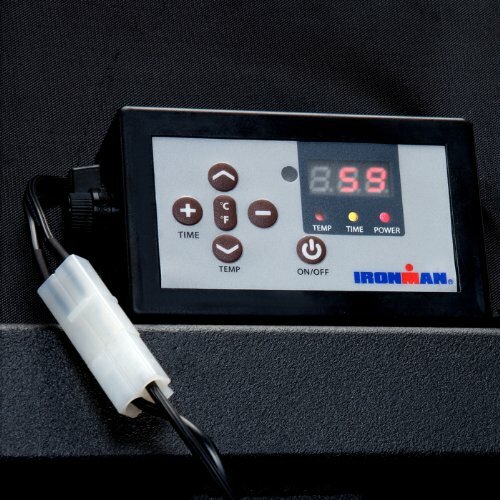 IRONMAN is one of the most trusted brands when it comes to inversion tables, and their IFT line actually introduced infrared technology to inversion tables. The IFT 4000 the latest from this line, offering more upgrades than previous models. One such upgrade is in terms of weight capacity. The IFT 4000 can handle up to 350 lbs., while the IFT 1000 can only handle a maximum of 275 lbs. Plus, this model features a quick-release ratchet gear system that provides a convenient way to adjust and release the ankle lock. You don’t need to bend over to reach the lock handle. Meanwhile, safety handles attached to the base of the frame are long and accessible so you can easily return to an upright position. This table can rotate up to 180 degrees to allow a full spinal stretch, and it can accommodate users with a height range of 4’9” to 6’6”. The infrared technology uses carbon fiber to provide a wide range of temperature options from 100 to 140 degrees. You can adjust the temperature to your liking using a remote control. The heat quality is excellent, and you get a comfortable backrest with a thick 2.5-inch cushion. The only drawback to this unit is, of course, the cost. It’s $100 more expensive than the IFT 1000, and is actually the priciest model on this list. The IFT 4000 is best suited to anyone who wants total comfort during inversion. The IRONMAN IFT 1000 is the foremost inversion table with built-in infrared technology on its back cushion. 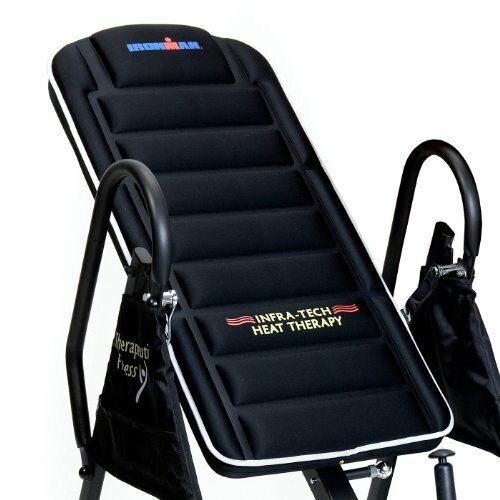 And while we have mentioned the upgrades that the IFT 4000 has, this model is still a reliable piece of equipment that combines soothing heat therapy with inversion treatment. Both the IFT 4000 and the IFT 1000 use the Far Infrared Ray Therapy, a patented system of adjustable temperature from 100 to 140 degrees. Users can set the temperature from the remote and adjust it before or during inversion. Both can also be adjusted to accommodate users of up to 6’6” height. The main difference is on the cushion: this model has a thinner cushion made of 1-inch foam, as opposed to the 2.5 inches on the IFT 4000. Also, the IFT 4000’s backrest is wider and has a heavier weight capacity, allowing for bigger and heavier users. The ankle lock system is also different. The IFT 4000 eliminates the need for users to bend over to reach the gear handle. It’s more user-friendly than the IFT 1000. But for users that have little issues with mobility, this inversion table will pose no problems at all. All in all, the IFT 1000 is a great and more affordable option for inversion enthusiasts with a slightly higher level of flexibility. 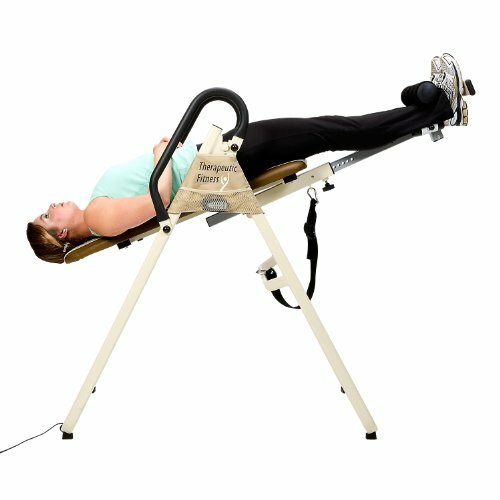 The Merax inversion table does not use infrared technology for its heating system, but it’s a good option for those looking for a cost-effective inversion table with heat therapy. 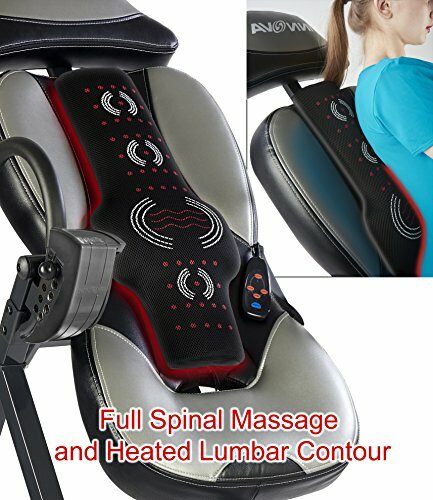 This model has a removable heat massage and vibration pad designed to relieve tension and pain on your back. So not only are you getting heat therapy while you are inverted, there’s also an added massage feature. And because it’s detachable, you can use the pad even when you are not on the inversion table. 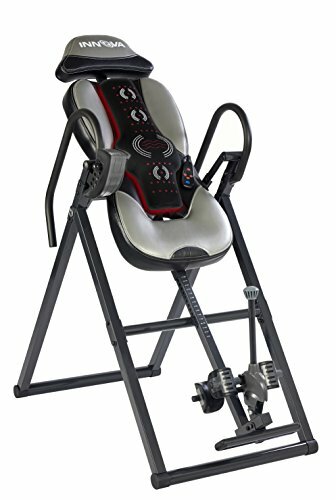 This inversion table uses high density thick foam ergonomically designed to provide comfort for its user. It can support weights of up to 300 lbs. and heights ranging from 4’11” to 6’1”. The pivot placement for the arms offer easy control of movement on the table, and the pin system adjusts the incline of the table to your preferred angle. Of course, the issue with this model is the quality of the heat it provides. Compared to infrared heat, this model will only give a superficial level of heat penetration. 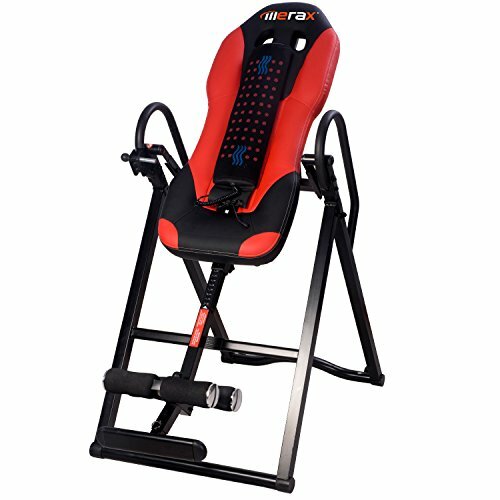 But for its price and innovative features, the Merax inversion table is surely a satisfying product. The Innova ITM5900 completes our list because it showcases new features that improve the therapeutic inversion experience. This model has a vertically positioned massage cushion that covers the spine area. Contour Integrated Heat and Vibrations technology guarantees that your entire back is heated and massaged. 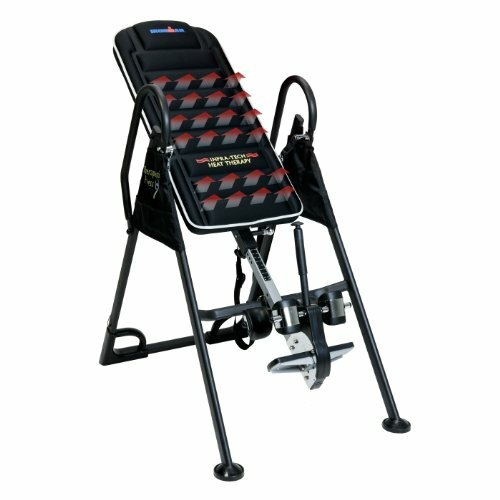 This inversion table also has a 5-position angle system that makes inversion simple and secure. You can choose the ideal angle each time. Like most tables, this one is pretty durable as it has a heavy-duty steel frame. It can handle a maximum weight of 300 lbs. and accommodate user heights ranging from 4’10” to 6’6”. What’s also great about this model is that it can be folded for easy storage, unlike units such as the IRONMAN IFT 4000 where you have to find a dedicated space for it. 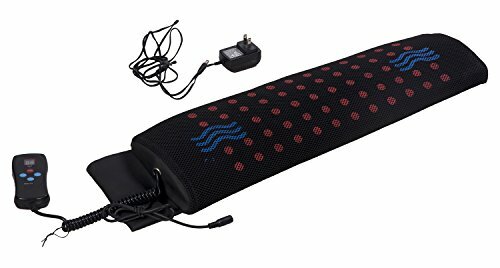 However, the heat from the vertical massage pad is electric, so it won’t have the same effect as infrared therapy. Infrared and heat technology is a great add-on to inversion tables. It enables soothing and healing of muscles, and you virtually get a 2-in-1 therapy with both heat and inversion treatments. These top inversion tables each have their pros and cons, and it depends on your personal situation whether or not you consider the quality of heat created by infrared technology to be worth the additional cost. We hope this article has helped you!